Sensei said that “the secret of budô is 武風一貫 bufû ikkan (translated in “unarmed fighting techniques of the samurai” p.51, by the way of war is survival*). This is the yang secret. In a fight the opponent is often aggressive (i.e. yin) therefore by opposing softness to hardness you can defeat the enemy. When facing a strong and violent opponent you have two options: be more aggressive and violent than him or be so soft that his own intentions and actions will defeat him. This is the secret of fighting. It reminds me of the encounter between the yamabushi monk Benkei and the young Minamoto no Yoshitsune during the Hôgen disturbance (保元の乱, Hōgen-no-ran1156). 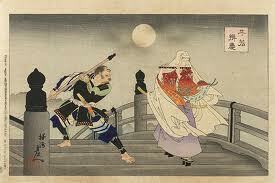 Benkei was a fierce warrior monk who defeated 99 samurai crossing a bridge he was standing on. Benkei had made the wish to take a 100 swords from samurai and to give them to the Buddha. When the young Yoshitsune arrived at the bridge, Benkei had already won 99 swords. Yoshitsune, defending himself with a simple flute overcame the big giant who then became his disciple. This is the typical example of how yin can defeat yang. In the bujinkan this technique is called goja dori and sensei details it in his book: “Togakure ryu ninpô taijutsu” (p.237). Sensei insists also on developing 五心術 goshin jutsu instead of 護身術 goshin jutsu. We should develop the heart/spirit if we want to ensure a true self-protection for ourselves. Brutal force is nothing compared to mental strength. In order to survive learn to use the yin within you. Next Post Disciple or Technician?